The British Gazette » Great wealth = Great health. The above title to today’s contribution to the internet does of course not always apply! However it is unarguable in these days of strained NHS resources that having lots of money enables one a better chance of remaining healthy for longer. This is of course why wealthy people tend to eat better than poor people. Great wealth allows one to make choices that poor people cannot make. A billionaire, even if they cannot drive, can afford to purchase a brand new Rolls Royce. The inability to drive and the concomitant lack of a driving licence is easily overcome by employing a chauffeur. 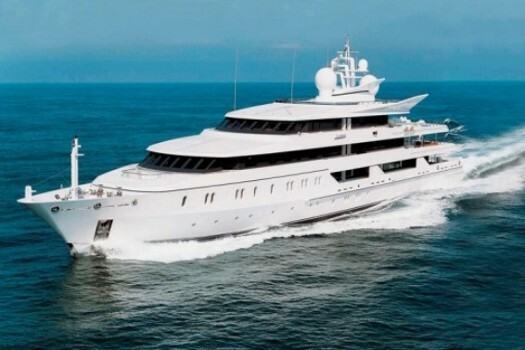 Whilst many billionaires do have driving licences and do like to get behind the wheel of their cars, the same freedom of choice does not generally extend to another favourite plaything of the billionaire – the luxury yacht! For that they require (by law) a Master Mariner. Whilst sitting on their car’s rear seat, the billionaire is the master, this legally is NOT the case when the billionaire is aboard his yacht. This is because maritime law states unequivocally that the ship’s Master is THE legal authority on the boat! In other words, when it comes down to it the billionaire has to do what he is told. That is the LAW. Of course most billionaires will be aware of this. But then the yacht’s master is not the employee they take most attention about recruiting. The most attention is given to the ship’s cook. This is because the super wealthy generally like super meals. Some sensible billionaires eat healthy – others do not. The important thing however to bear in mind that these billionaires have a choice as to whether to eat healthy or not. Now at this point we are sure that there will be Tory activists who will shout out: “So do the poor! They can eat healthy for very little too.” We would suggest that such claims are rather like the claims motor car manufacturers make or used to make about the miles per gallon (sorry, Derek – kilometres per litre) figures of their cars. Namely that a car would do x mpg (kpl) at 56 mph (90 kph) when this figure could only be duplicated in laboratory conditions and not on the road. If these Tory activists wish to educate themselves as to how poor people eat, we would suggest that they visit a supermarket or other retailer selling ready made microwavable meals and observe the numbers of poor people buying such meals when they are marked down to prices such as 30 pence or 50 pence. Many poor people realise that these meals do not constitute the “healthy option” but to those struggling on a low income know it is the “affordable option”. Of course, not all such poor people visiting such stores at such times and making such purchases were always poor. Some either through their own fault or someone else’s fault, find themselves in that position. Of this your Editor can speak from first hand experience. For a while I was in that position. I got out of it however. How I got into it is however as instructive as to how I got out of it! The dispute that was settled outside court was centred around the supply of some commercial equipment. This equipment was purchased second hand by myself and it’s purchase was the subject of a business finance. The commercial seller of the equipment had warranted it as safe. It was not. As it turned out the commercial seller was not acting dishonestly but was acting incompetently as they did not exercise due diligence. Eventually you see it was discovered that the first commercial owner of the equipment had breached their obligations insofar as the proper and correct maintenance by hiring on the basis of “no receipt, cash please” with a unknown trades-person. This trades-person was just not incompetent but dangerously incompetent. Their malign attentions to this commercial equipment rendered it legally unusable by myself. As a result I was in dispute with the firm I purchased the equipment from and also the bank. The firm refused to accept responsibility and the bank refused to walk away from the finance by insisting – as they were contractually entitled to do – to hold their agent – who was my supplier (a licensed credit broker) to account. In the end the dispute was settled by having the equipment put into a legally operable condition and it being sold. The dispute had it’s costs. In terms of £/s/d I got off lightly – it cost me many hundreds of pounds. However, for the bank their stupidity – from refusing to walk away and incur no liability – it cost them many thousands of pounds. This huge difference in costs is due to one particular aspect of the dispute: I was acting as my own legal representative. The bank was using an expensive firm of civil litigation specialists. Their expensive lawyers will have told them that they had no case. However the bankers were idiots and had decided to adopt a policy that many wealthy individuals do: that is to use their wealth (in this case their employer’s wealth) to bully and coerce the defendant into submission – unjustly. The late and unlamented Robert Maxwell was a famous exponent of this cruel, ruthless and vindictive strategy with his fondness for issuing libel writs to any who appeared to threaten his fraudulent activities. So, Dear Reader, who in fact ended up paying? Well, this is not going to make pleasant reading for our UK readers for the answer Dear UK Reader is you! You see this particular bank was bailed out by you the taxpayer! This strategy of legal bullying ONLY works against a natural person or body corporate who cannot afford lawyers! It does NOT work against a natural person or body corporate who CAN afford lawyers. However it seems “the bleedin’ obvious” is not obvious at all to the dear, demented, green lobby! You see, the term “idiot” does not seem to do justice to the monumental level of their imbecility in their lunatic decision to sue such as Royal Dutch Shell for the damage caused by climate change! You see, multi-billion-dollar multi-nationals such as Shell can afford teams of the very best lawyers! Whereas I a self employed businessman could not! So a word of advice to those unfortunates such as Caroline Lucas: “Dear Lady, IF you intend to take legal action on the basis that you have NO CASE – you most assuredly DO NOT attempt this strategy against an opponent to whom employing a team of solicitors and a team of barristers and a team of “silks” is in fact a MINOR expense! Such a strategy is doomed to failure! The reports below indicate at this early stage the wheels appear to be coming of their legal bandwagon!